This was a story I was supposed to write two years ago, but I got sidetracked. Luanne and I had been to the beach. I met a local realtor who gave me a list of 5 restaurants I should visit if I wanted to be guaranteed fresh, authentic, local seafood, you know Gulf of Mexico, not Gulf of Tonkin. We happened to be at Bill's by the Beach when we had this conversation, so that was the first on his list. The other four were, in no particular order, Fisherman's Corner, Shipp's Harbour Grill, Fisher's at Orange Beach Marina, and Sunset Cork Room. I made it my mission to visit them all. I also planned to write about all of them, but somehow, time got away. I chronicled my visits to Fisherman's Corner, Bill's by the Beach and Shipp's Harbour Grill, but never got around to finishing up with Fisher's and Sunset Cork Room. Then, the last time I was at the beach, Scott mentioned he would like to eat at Sunset Cork Room, so we drove over. We could not believe what we saw. The restaurant had been badly burned. We tried to find out if the owners were going to close permanently or if they would reopen at some point, to no avail. For some reason, I thought about Sunset Cork Room the other day and looked them up online. I found a phone number and gave them a call and to my complete surprise, someone answered. I told her I was just wondering if they had reopened and she said they had. I replied, "Hallelujah!" She seconded that sentiment and told me to please stop by the next time I was in town. Most of us think of the beach as a place to relax and get away from our troubles, but folks who live at the coast have to be a hardy and resilient bunch. Since opening in 2004, Sunset Cork Room has survived Hurricane Ivan in '04, Hurricane Katrina in '05, the BP oil spill in '10, extensive flooding in '14 and now a devastating fire. Beach living is not for the faint of heart! Anyway, all that thinking made me think about my first visit to Sunset Cork Room, so here it is. I have no idea if it looks anything like it did when I was there, so the pictures I have may or may not represent what you will see if you visit now. Sunset Cork Room should not be that hard to find but my GPS was stumped. It is not on the beach road and the owners really don't advertise, at least not that I have ever seen. I think the locals want to keep it all to themselves. Too bad, I found it! If you are heading north on highway 59, you will pass King Neptune's on your left, cross Ft. Morgan Rd., pass Walmart on your right and Holiday Inn Express on your left. When you get to E. 16th Avenue, turn right. I don't know why this little road was so hard for my GPS, but it was! Anyway, after your turn onto E. 16th Avenue, Sunset Cork Room will be on your right. I went early, like 4:00 pm, so the restaurant was pretty quiet and I was seated very quickly. The dinner crowd had not yet begun arriving. I was presented with a menu and a basket of very delicious rolls and real butter to munch on while I studied the menu. I also had time to look around the restaurant. Sunset Cork Room has real tablecloths and low lights, so while it is more upscale than, say, a crab shack on the beach, it is still not fussy. You might not want to wear your t shirt and cut-offs, but you definitely don't have to dress up. If you wear your nicer casual clothes, you will be right at home at Sunset Cork Room. This is the beach, after all! As I looked at the menu, I was intrigued by the lamb lollypops, but I ended up ordering the beef tenderloin sliders. I know, I came because Sunset Cork Room has a reputation for having very fresh, very local seafood, but those tenderloin sliders sounded so good. My server told me when they trim their beef tenderloins, they use the trimmings and grind them for their burgers. I also ordered a house salad. Here is what it looked like. When I tell you this was one of the best salads I have ever had, I am not kidding. To me, one of the key ingredients of a salad is fresh ingredients and this salad was about as fresh as it could get. The romaine was green and crispy, the tomatoes were juicy and the whole thing was topped with red onions, crispy smoked bacon and crumbled blue cheese. I would go back for this salad alone. Look at those sliders! They were so good! The fat little burgers were sandwiched between fat little buns, speared and topped with fat little olives and accompanied by pickles, tomatoes, lettuce and herbed aioli. For someone who makes it her mission to order seafood at the beach, I could not have been happier with my meal. Three Friends and a Fork give Sunset Cork Room a giant Hallelujah and 3 Congratulatory Yums UP! 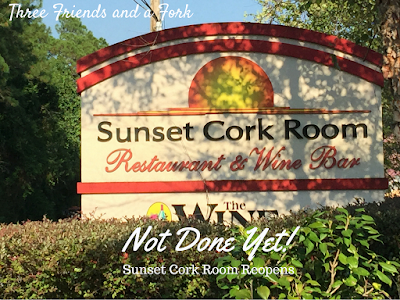 I can't wait to visit Sunset Cork Room again and see what changes they have made since the post fire remodel. You should check them out, too!